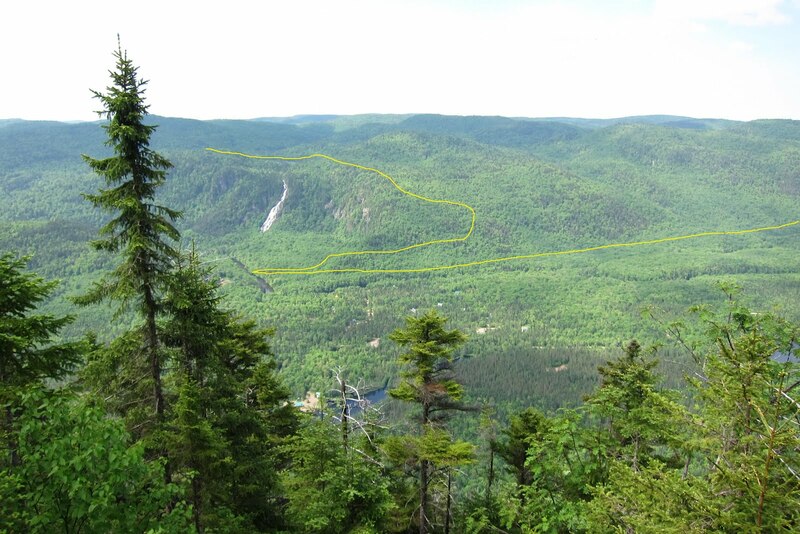 Our snowshoe hike followed the yellow line to a hut above Delaney Falls. Yes, it is still winter and there is still some time left for some winter cross-training. But going to the gym is hard, so if we are going to have to cross train, it probably isn't going to be inside a gym. We think that cross training should be performed in a place that closely resembles paradise. How about Vallée Bras du Nord near Saint-Raymond? Bingo! We put snowshoes in the car and voyaged to the Vallée Bras du Nord (literally: north arm [of the river] valley, it is not about northern underwear) near St-Raymond (that's located a bit past Trois Rivieres) yesterday and again we managed to avoid biking there - this time due to snow. But of course this was our plan - late season snowshoe hiking in perfect blue sky conditions. And... perfect cross training for the upcoming cycling season - upper and lower body! We promise to visit here again this year, finally, to do some mountainn biking on their fine new mountain bike trail network. Snow bugs, yes, bugs plural: there are two bugs in the picture. Each tiny little dot was a bug. The thing in the middle is a pine cone, not a bug or the bug's mothership. As usual... back at the car a few minutes after sunset. We left the car about noon, and the hike took about 7 hours. Summit of Sentier Boucle du Hauter continue the loop in a northy direction, then down to the river and back to the bridge and civilization. Back to the bridge just as the sun leaves the sky. Hey, at least it wasn't dark yet. The Vallée Bras du Nord is a very modern outdoor recreation destination with excellent trail signage. Trail info is nice, but there could be more maps too. The newly built reception chalet from the Boucle des Hauteurs trail. As usual, sunset is occurring and we are not back to the car yet. A perfectly perfect day for snowshoeing. Seriously folks, this is paradise. The river wasn't quite warm enough for a quick dip. Looking north up the valley: more magnificent scenery. Rules for mtn bikers: you are on your own - be careful! Click and read please. This is semi-remote wilderness and this sign is full of useful info about surviving your visit to the wilderness with as little negative impact to both you and the wilderness. The Vallée Bras du Nord endorses the "Leave No Trace" set of seven outdoor use practices that you should already be doing. Also, you must pay to play here. You contributions directly support the further development of this most excellent outdoor recreation destination. Is there anything better than full-on spring sunshine? How about the fact that the trail is now DOWNHILL. So, yes. We hiked that massif last june. Today's hike took us above Dellaney falls to the Refuge Yourte. The refuge is above the cliff to the left of the falls. There is an amazing view from up there. Refuge Le Hutte on the Sentier Castors trail. Cross this bridge to attain outdoor bliss. The first and only outdoor competency test you must pass to play here is to cross this swaying suspension bridge. New accueil (reception) chalet is now built. This reception building was under construction last june. Americans: please take a moment and pronounce the word "accueil" out loud. The feds helped build this modern outdoor paradise. Some visitors didn't like the word Canada messing up their made-in-Quebec paradise, so they scratched it out. And out. And out again. (But they still missed one). For good measure, they scratched out the maple leaf symbol too. Both of them! The Maple leaf is the official symbol of Canada. The official tree of Quebec is the yellow birch (aka silver birch) which is the Bouleau jaune in french. The only real problem with Vallée Bras du Nord is that the last couple of miles to get there is dirt road - and awesomely bad dirt road at that. We hope this will change soon. The Vallée Bras du Nord is Paradise found.